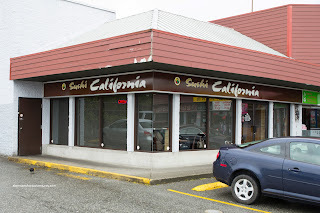 Sushi California has been on my revisit list for quite some time, partly because I only got takeout previously and that they had renovated as well. I tried awhile back but it was not meant to be because there was a lineup out the door and the parking lot was jam-packed. Now that is a common occurrence as there are roughly 20 parking spots for 3 restaurants in the tiny corner mall. Why is the place so popular? Well, it follows the same formula as Sushi Town and Sushi Garden - big portions and low prices. However, much like the aforementioned restaurants, don't expect super authentic nor carefully made eats either. 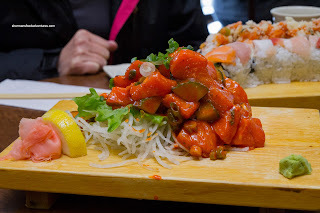 We started with an order of the Spicy Salmon Sashimi. It was piled high with a mix of crunchy cucumbers and a relatively mild spicy sweetness. The salmon itself was decent being buttery, yet still firm. If I had to do a comparison, the one at Sushi Town is bigger in size and had a more impactful dressing. 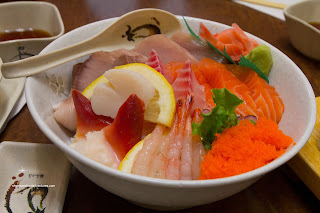 And as per usual of late, I got an order of the Deluxe Chirashi Don. As you can see, there was a substantial amount of sashimi on top including amaebi, tobiko, salmon, tuna, hamachi, hotate and hokkigai. They were all decent while the rice was chewy with a hint of sweetness and vingear. This was surprisingly good. Onto a couple of rolls, we tried the Rainbow and the Double Spicy Tuna. The rainbow was a little different than typical versions since it only had tamago in the middle. There was very little sashimi on the outside as well. I guess for $6.00, we weren't expecting a whole lot. If you can imagine, the roll was pretty "blah" because of the lack of ingredients. Fortunately, the spicy tuna roll had a double dose of tuna on the inside and out topped with tempura bits. Tasting similarly to the spicy salmon sashimi, this was a more substantial and tastier roll than the rainbow (cheap too at only $4.00). For the kiddies, we got them the Tempura Udon which was devoid of all the "additions" that many non-Japanese run restaurants employ. 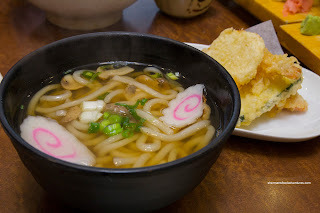 Hence, the udon was simple with a relatively bland broth. In addition to the side tempura, we got an extra order of Ebi & Yam Tempura. 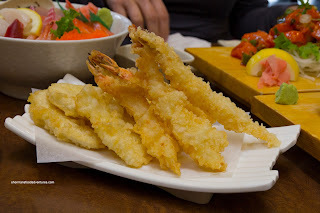 Despite the heavy layer of batter, the tempura was still relatively light and crunchy. It wasn't overly oily either. This revisit to Sushi California was pretty much what we had expected - large portions, reasonable prices and okay eats depending what you order. With those expectations, then our meal was pleasant enough complete with surprisingly good service (despite what others have said). I recently moved to this area and have visited Sushi California a few times and definitely have to agree with you on that some stuff is okay and other stuff is not okay. Overall it's just mediocre. I really am disappointed that there are so few GOOD sushi restaurants in this area. I'm not even looking for authentic Japanese food! I generally find the sushi in the area to have either bland rice, stale ingredients, and/or are sloppily made and just lack care altogether. @Kay - for "better" sushi and related foods, you're better off visiting the many Korean restaurants in Burquitlam (Sherman can easily point you to some good ones). 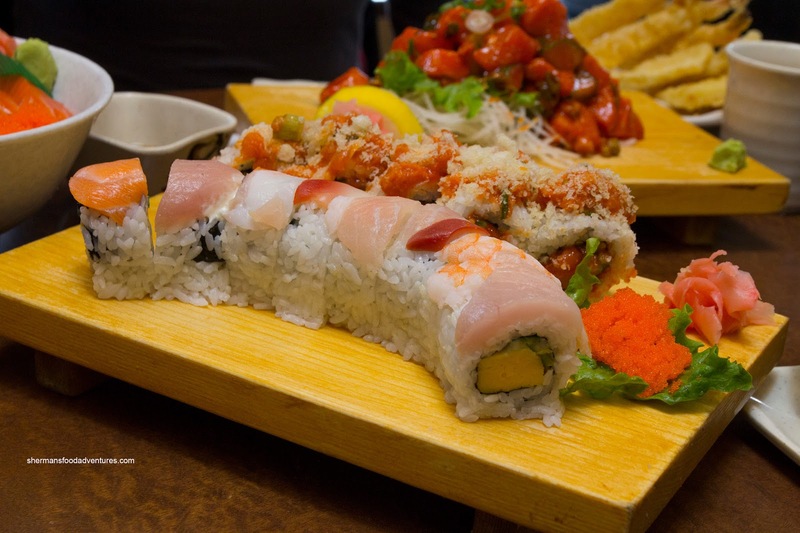 Places like Sushi California offer "McSushi" for lack of a better term, for the masses, with little care to authenticness, quality and true value.